Name This is the name that is associated with the schedule. In Hours Destination This is the assigned Destination where the calls will go during the schedule’s hours of operation. Outside of Hours Destination This is the assigned Destination where the calls will go when it is received outside the schedule’s hours of operation. If “Apply Forwarding Settings” is enabled (checked), to use the destination’s call forward settings. The items in the drop-down listing are the configured Destinations in your PBX system. Lunch Hours Define the hours allocated for lunch for a schedule. Calls received during this time will be sent to the Lunch Hours Destination. Lunch Hours Destination This is the assigned Destination where the calls will go when it is received during the allocated Lunch Hours. Holidays = Holiday NameThis is the name associated with this holiday schedule. DestinationThis is the assigned Destination where calls will be routed when it is received during the holiday schedule. From the Destinations=>Schedules page, click on the ADD Schedule button. The Edit Schedule Switch page appears. Enter the settings for the new schedule. From the Destinations=>SchedulesEdit Schedule Switch page, scroll down to the Holidays section of the page. Enter the dates and times for the new holiday schedule. Click the Add button to add the new holiday schedule. Select the holiday (appearing in the list) that you want to remove. Click the Remove button to delete the holiday schedule. The item in the Holiday list is removed. From the Destinations=>Schedules page, locate the schedule name that you want to edit. Click on icon to the right of the Name of the schedule you want to update. The Edit Schedule Switch window appears. 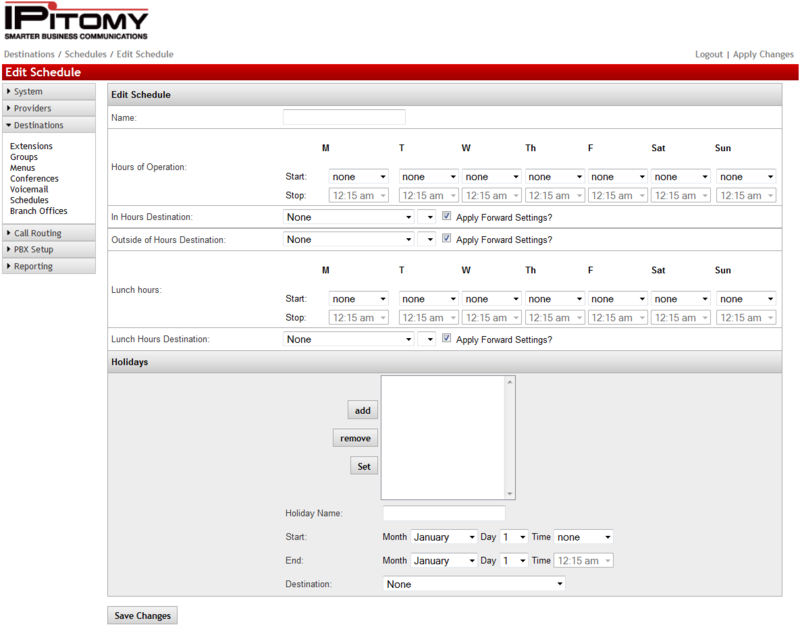 Edit the necessary parameters to configure the schedule. From the Destinations=>Schedule page, locate to the Schedule Name from the listing that you want to delete. Click on icon to the right of the Name of the schedule you want to delete. The schedule is removed from the listing page.